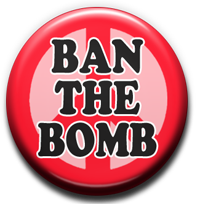 Congratulations to the Nuclear Age Peace Foundation on being endorsed by Archbishop Desmond Tutu for the 2016 Nobel Peace Prize! A world-renowned spiritual leader and social activist, Archbishop Tutu is himself a past recipient. The Nuclear Age Peace Foundation is featured on our Sweet Songs Page here. You can also find out more about them here. There are perhaps no more convincing arguments for peace than those made by the soldiers who have been on the front lines. I got an eye-opening letter from David of the Nuclear Age Peace Foundation this morning. He conveyed slightly alarming information to the effect that the leaders of nine nuclear-armed countries are now in a position to activate close to 2,000 nuclear weapons. The Nuclear Age Peace Foundation (NAPF) works to foster hope and inspiration and to promote active engagement in peace building. One of its main areas of activity is related to obtaining a signed treaty banning and eliminating all nuclear weapons worldwide. The organisation also offers educational resources to help people better understand the issues of peace and the abolition of nuclear weapons. There are approximately 17,000 nuclear weapons in the world in nine countries: United States, Russia, United Kingdom, France, China, Israel, India, Pakistan and North Korea. Over 90% nuclear weapons are in the arsenals of the United States and Russia. For more information on The Nuclear Age Peace Foundation, click here. You can also watch a short introductory video here, on our Sweet Songs page. In the wake of the attacks on Paris, several individuals have stepped up to take a stand for peace and brotherhood, emphasizing the surprising influence one person can have on perceptions and attitudes. Words of Peace is an independent charitable foundation set up by people who were inspired by Prem Rawat, a man who has been sharing his message of peace for over five decades. The organisation provides access to materials and supports Mr. Rawat’s work. In 2014, over one million people heard him at live events as he toured over 40 cities and visited 16 countries. Founded by Dr Scilla Elworthy in 2002, Peace Direct is an award-winning, international NGO that finds, funds and amplifies the voice of local peace builders operating in some of the most challenging conflict environments worldwide. With offices in the UK and the US, the organisation runs 10 partner programs in 8 countries and is the force behind Insight on Conflict, an online local peacebuilding resource with up-to-date reports on current conflicts and listings of local peace organisations. Peace Direct programs support grassroot peacebuilders working to disarm rebels, resettle refugees, heal communities and revive economies. For a quick video featuring founder Dr Elworthy, please see the Sweet Songs page here.